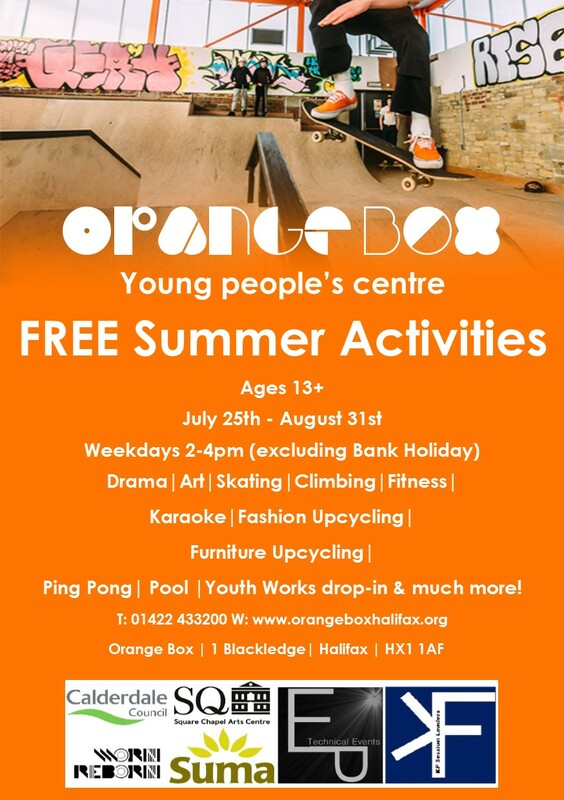 Orange Box young people’s centre will be hosting FREE Summer Holiday activities over the school holiday for ages 13 – 19 years. Activities will run from Wednesday 25 July to Friday 31 August, 2:00pm–4:00pm, Monday – Friday (excluding August Bank Holiday). This Summer Holiday activities will be taking on a health and well-being theme, chosen by our young people. Get active in the fitness workshops run by Orange Box volunteers and young people. Enjoy art and design sessions for a mood boost and release your inner interior designer by upcycling a piece of furniture! You will also have the opportunity to create something stylish to wear with Worn Reborn, show your talents on our open mic stage, sing karaoke, climb the bouldering tunnel, play table tennis and pool, skate in the rooftop skate park and try a Mindfulness or Drama workshop delivered by Time Out Calderdale. There will also be access to Youth Works drop-in which is a safe space for young people aged 13-25 to go along, ‘chill out’, listen to music, access the internet or have a brew. The drop in is open weekdays from 3:30pm to 5:45pm. Activities will vary from week to week so keep an eye on the Orange Box Facebook page for regular updates. This entry was posted in Aug, July, Young People and tagged Orange Box. This entry was posted in Events, June, May, Young People and tagged Orange Box, Orangebox Young People's Centre. Sports Box has now ended on Saturday afternoons but Orange Box have thanked Sports England for the Sportivate funding for the sessions over the past 18 months. 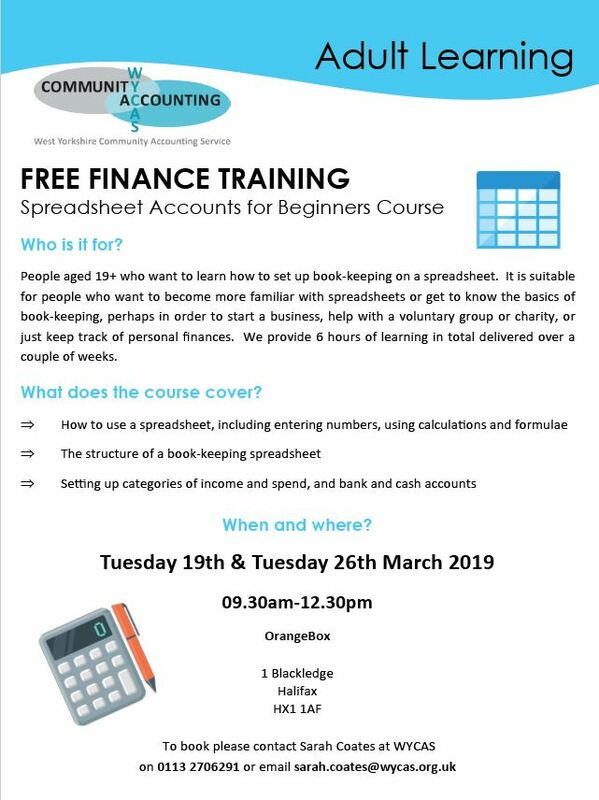 But just a reminder of the FREE activities that are happening at Orange Box. Upcycle furniture and clothes, sing karaoke, enjoy yoga and drama, go zorbing, climb the bouldering tunnel, play table tennis, cook healthy meals, skate in the rooftop skate park and celebrate with an end of summer party. Keep your eye on the Orangebox Website or social media for a detailed timetable coming soon. (you will need to register when you arrive, if you haven’t already, or you can fill out a registration form here and take it with you when you go). This entry was posted in Aug, Events, July and tagged FREE Activities, Orange Box. Do you want to get to grips with the refugee crisis and the impact it’s having in Calderdale? Maybe you want to learn more about setting up a not-for-profit organisation. Sector Support Calderdale is holding a variety of training sessions from Tuesday 24 January including a Dementia Friends information session and more at the Orange Box, Halifax and Illingworth Fire Station. Sector Support Calderdale training courses are now chargeable and the training costs vary from £10 to £55 – Payments can be made by bank transfer or cheque made payable to North Bank Forum – If you would like to pay by bank transfer, please contact for details. This entry was posted in Feb, Get Involved / Have Your Say, Jan and tagged calderdale, February, Get Involved, Illingworth Fire Station, January, Orange Box, Sector Support Calderdale, Training.